So far, less than a handful of modern wind turbines have been constructed in Iceland. It has simply been more economical to harness geothermal- and hydro resources for power generation. 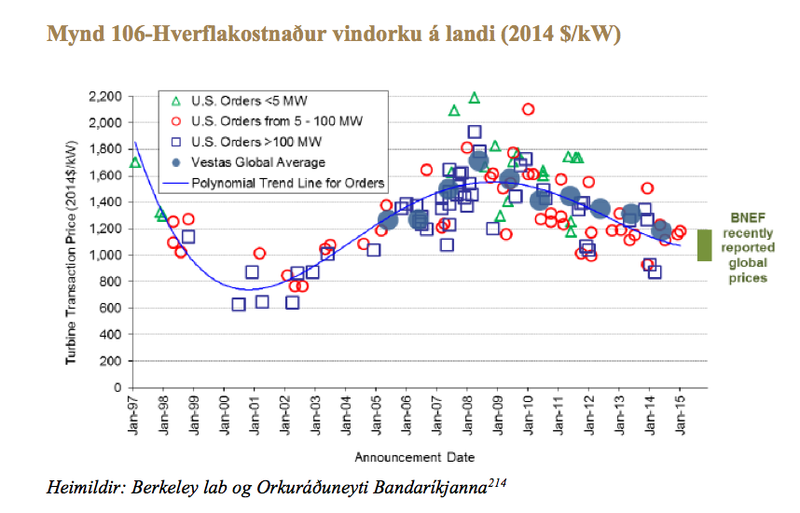 This situation may be changing, as it is becoming economically interesting to harness Icelandic wind energy. In this article we take a look at some hydropower projects that are currently being considered in Iceland, comparing them to the cost of utilising wind energy. It turns out that harnessing the Icelandic wind may indeed becoming a very interesting investment. LCOE for onshore wind. Analysis by Lazard. It has been called “the fastest and most astonishing turnarounds in the history of energy“: In some areas, building and running new renewable energy has become cheaper than just running existing coal and nuclear plants. 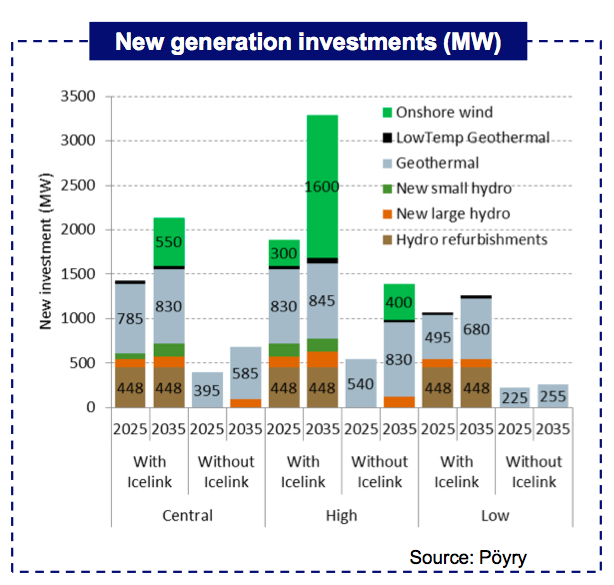 As Iceland is or at least has been quite special, by generating all its electricity through harnessing fairly low-cost geothermal- and hydropower sources, one might wonder if the declining cost of wind and solar will have any consequences for the Icelandic power sector? The answer is not very complicated. Due to Iceland’s northerly location, solar power is not becoming a real competitive option in generating electricity in Iceland. 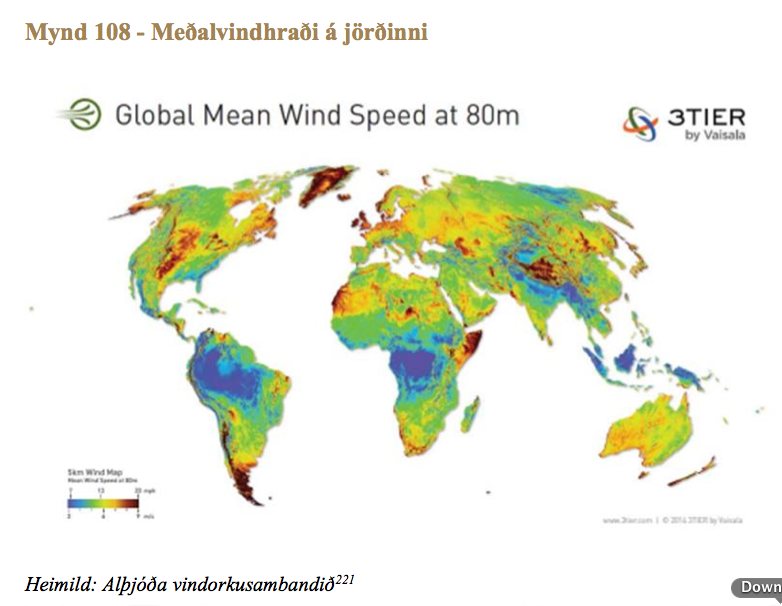 On the other hand, Iceland offers numerous locations with very high wind capacity factor. Thus, the declining cost in the wind power industry may soon drive important changes in the Icelandic power sector, where wind farms will become a lucrative business. Several small hydroelectric projects (with a capacity below 10 MW) are currently being prepared in Iceland. These include 9.9 MW Brúará hydropower station in South Iceland, 9.8 MW Svartá hydropower station in Northern Iceland, 9.3 MW hydroelectric plant in glacial river Hverfsfljóti in Southwest Iceland, and 5.5 MW Hólsvirkjun hydropower station in Northern Iceland. The combined capacity of these four stations would be close to 35 MW. With an estimated cost well above 3 million USD pr. 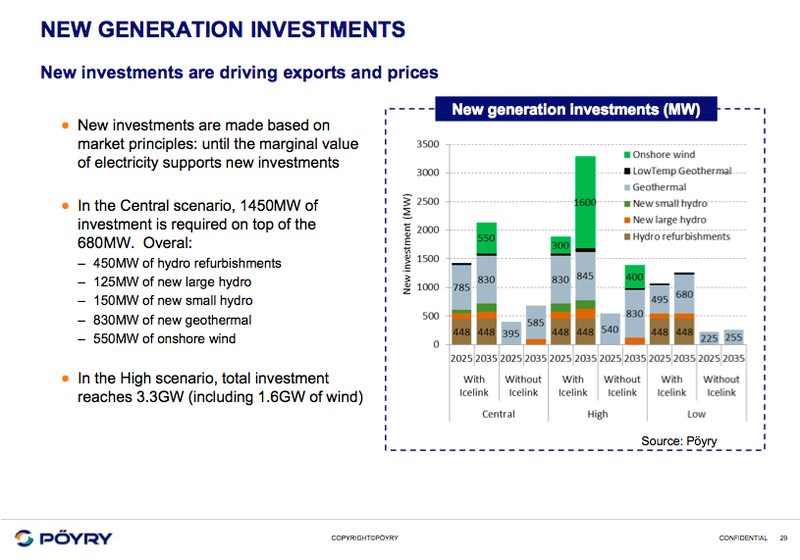 each megawatt, all those projects will be quite costly and probably more costly than harnessing Icelandic wind energy. Somewhat larger project is the 55 MW Hvalá River hydropower station, to be constructed in the faraway Northwestern part of Iceland (Vestfirðir or West Fjords). This power plant will be quite costly and the transmission cost will be high, as the project is far away from the current transmission system. However, due to the high reliability of the Hvalá station with its mountain reservoirs, the project can be seen as quite sensible. On the other hand, wind farms may also offer quite strong reliability, such as if constructing three 30-40 MW of wind power in different locations in or close to the West Fjords. By locating the wind farms adjacent or close to the current transmission lines, such a project might be less costly than the somewhat expensive Hvalá hydroelectric station with its high transmission cost. According to a recent study published by the federation of energy and utility companies in Iceland (Samorka), the levelized cost of energy (LCOE) for upcoming Hvalá River hydropower station is expected to be 49.70 USD/MWh (and then the transmission cost is not included). 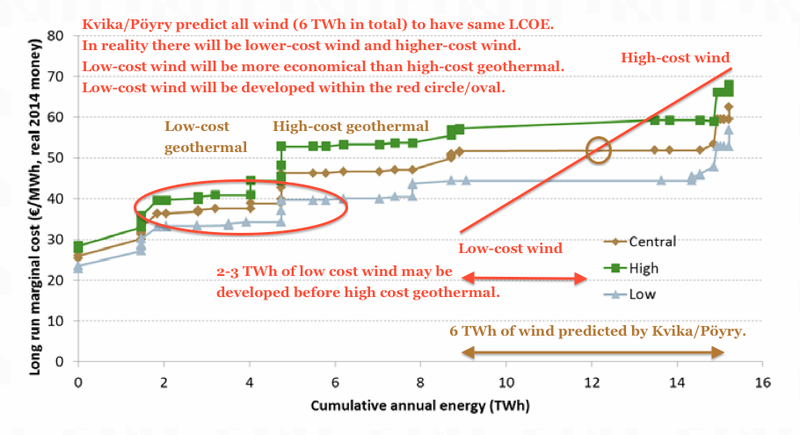 In comparison, in its most recent “levelized cost of energy analysis” (LCOE), financial advisory and asset management firm Lazard now estimates the LCOE for wind farms in good locations in the USA as low as 30 USD/MWh (as explained on the slide at top of the article). Slide by IIT Comillas and MIT. 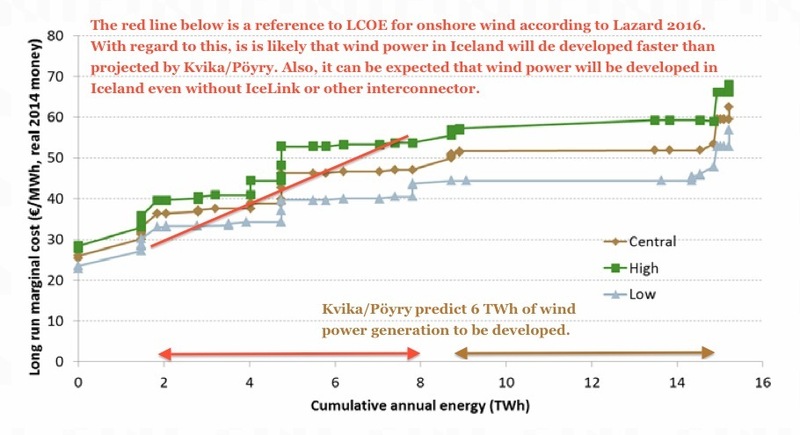 It is also interesting that according to a new study by the universities IIT Comillas in Madrid and MIT in Boston, wind farms in Iceland could generate electricity at LCOE close to or even below 35 USD/MWh. 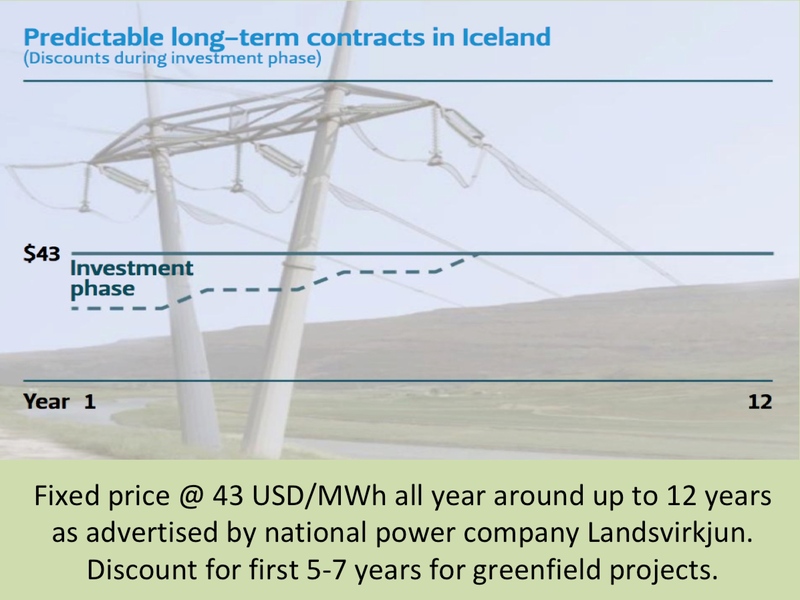 This low cost beats all planned geothermal projects in Iceland and is lower cost than most of the hydropower projects under consideration, making the development of wind farms in Iceland highly interesting. However, it is still interesting to invest in new geothermal- and hydropower plants in Iceland, as they in general offer very reliable power production. 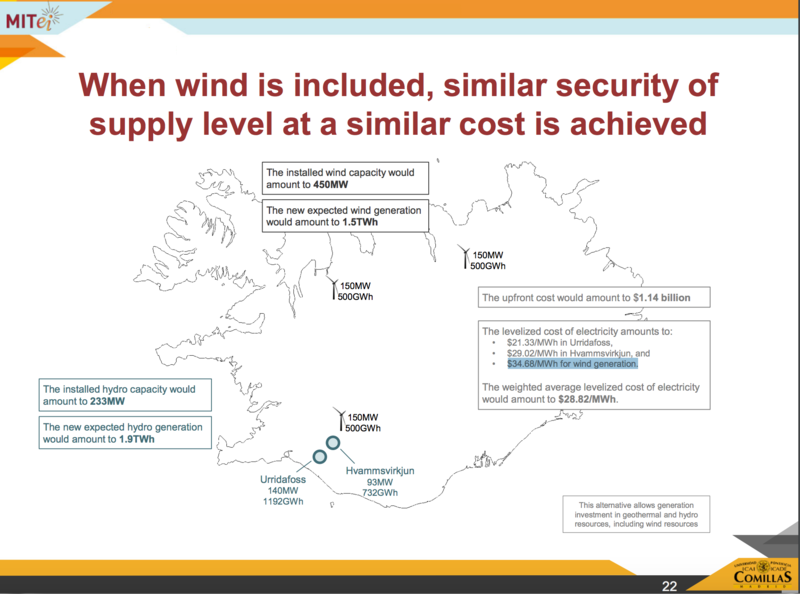 Iceland is an isolated power market with no interconnectors to other countries, and thus the country has to rely on domestic access to spare capacity when the wind would not be blowing well enough. For wind farms to be competitive in Iceland, they need to be cheap enough to make it an interesting option to increasing the output from the robust system of the Icelandic hydro reservoirs (such process of adding new turbines to conventional hydropower stations has already started in Iceland). By such methodology it will be possible to add substantial capacity in the power system without constructing expensive new hydropower reservoirs or geothermal stations. Also, low-cost Icelandic wind power could be harnessed to save water in the current reservoirs, and/or work as pumped hydroelectric storage. Due to such interesting possibilities, it is likely that wind farms will soon be constructed in Iceland even without any connection with foreign power markets. 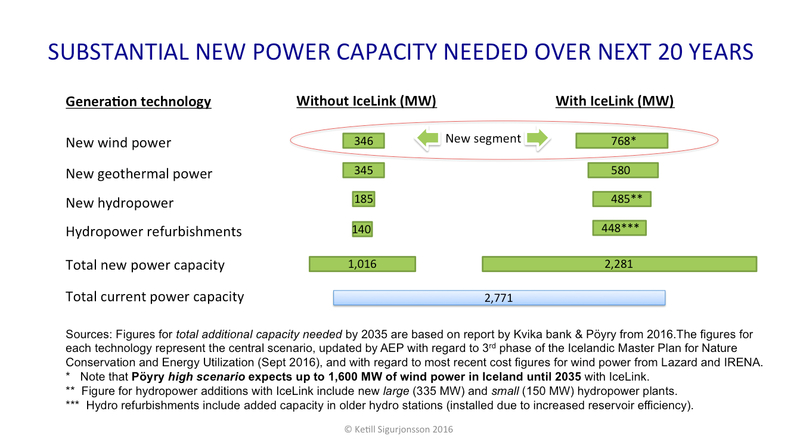 Of course an interconnector like IceLink would make Icelandic wind power even more interesting to harness. One wind farm instead of four hydroelectric plants? Earlier we mentioned the four fairly small hydroelectric projects (each below 10 MW) currently being prepared in Iceland. When comparing how much wind power would be needed to offer equal generation as the four hydropower stations, it seems quite clear that harnessing the Icelandic wind would be less costly and have less negative environmental impacts. The total power capacity of the said four hydropower stations (Brúará, Svartá, Hverfisfljót and Hólsvirkjun) will/would amount to approximately 35 MW. Some of them would have the advantage of offering quite stable generation all year around, while a project like the 9.3 MW Hverfisfljót hydropower station would be harnessing glacial water where the flow in winter is very low. 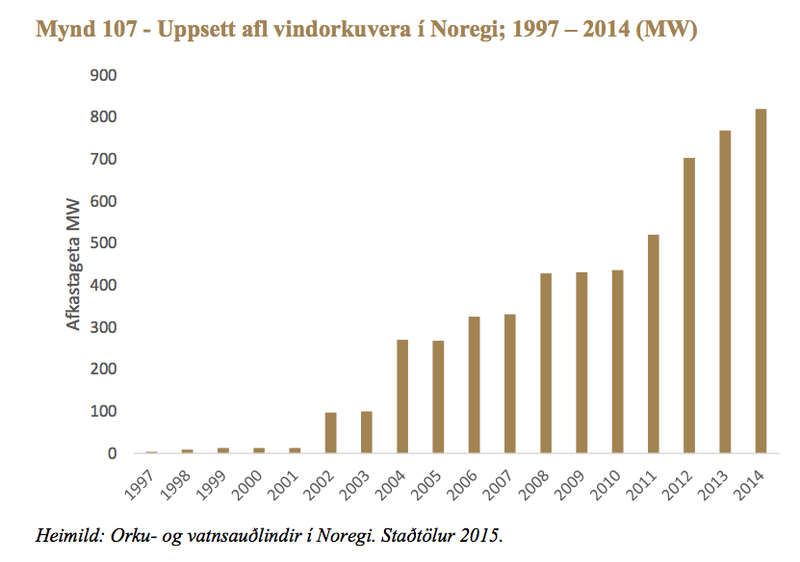 This means that the yearly capacity-factor of the Hverfisfljót station will probably be quite low; even under 50%. Of course a wind farm would deliver more fluctuating production than the combined four hydropower stations, thus needing more backup power. And in the long run, hydropower is probably almost always the lowest cost option (due to very long life time), at least if the environmental damage by dams and head-race canals of the hydro projects are not taken into account. It is not simple to estimate how much Icelandic wind power would be needed to generate a similar amount of electricity as the four hydropower stations. Probably a well-located Icelandic wind farm(s) with a capacity of approximately 70-80 MW could generate as much electricity annually as the four hydropower stations of totally 35 MW. The cost of the hydroelectric stations would most likely be close to USD 120 million. 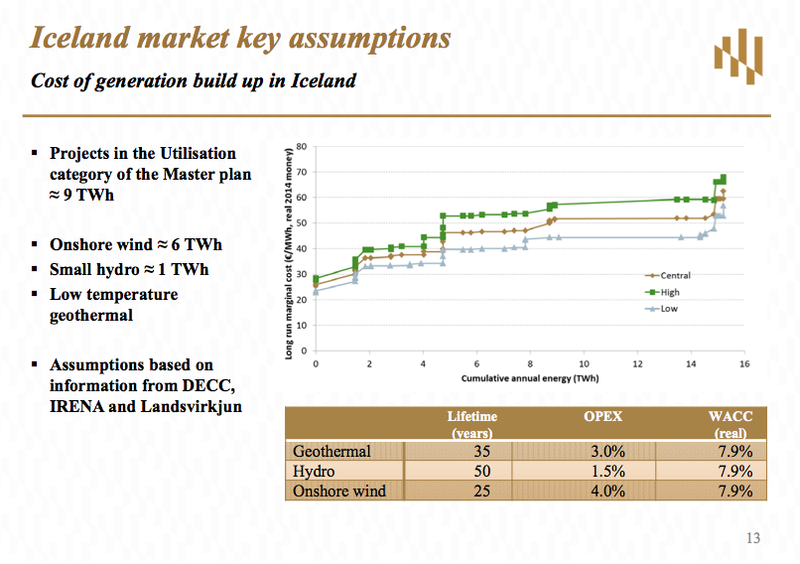 The cost of 70-80 MW wind farm in Iceland could be substantially lower; probably below USD 100 million. When also having regard to the environmental impact, the option of wind power in Iceland becomes even more attractive. 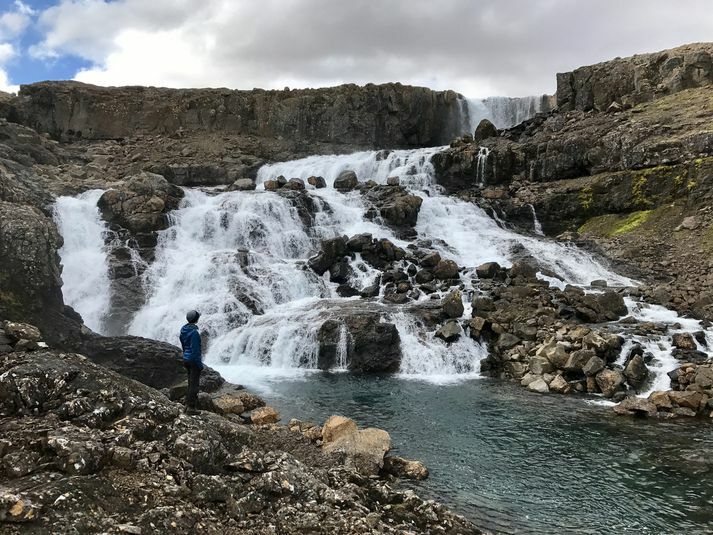 Besides the wind farm(s) of 70-80 MW being less costly than the four hydropower stations of 35 MW, the wind farm offers the chance of avoiding severe environmental damages to some of Iceland’s wild and free running rivers. 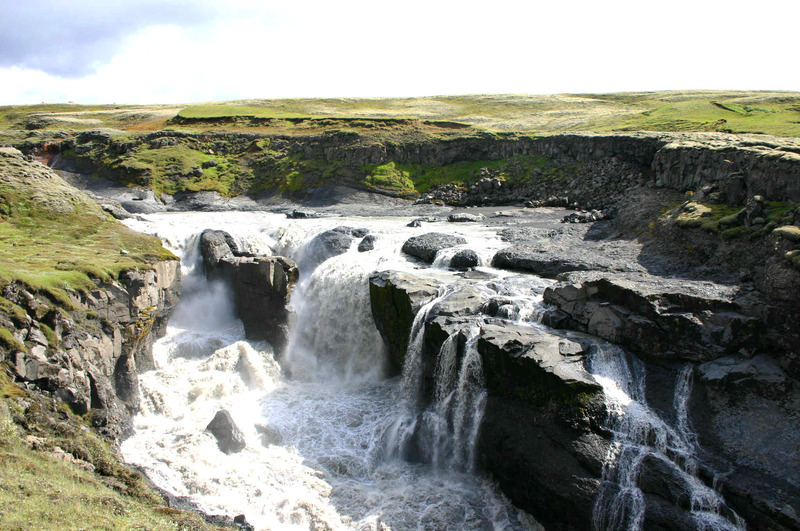 For example in the case of the Hverfisfljót hydropower project, the waterfalls in the river-canyon would become close to dry substantial part of the year. However, the key issue for harnessing Icelandic wind power is the declining cost in wind energy technology. Which now is making wind power a real option in the Icelandic energy sector. 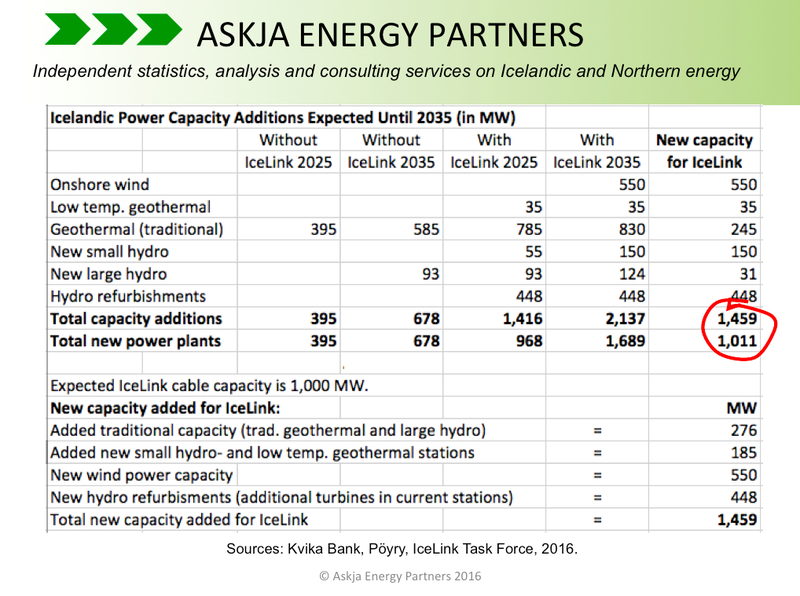 NB: Icelandic wind power development firm Hreyfiafl has same ownership as Askja Energy Partners. 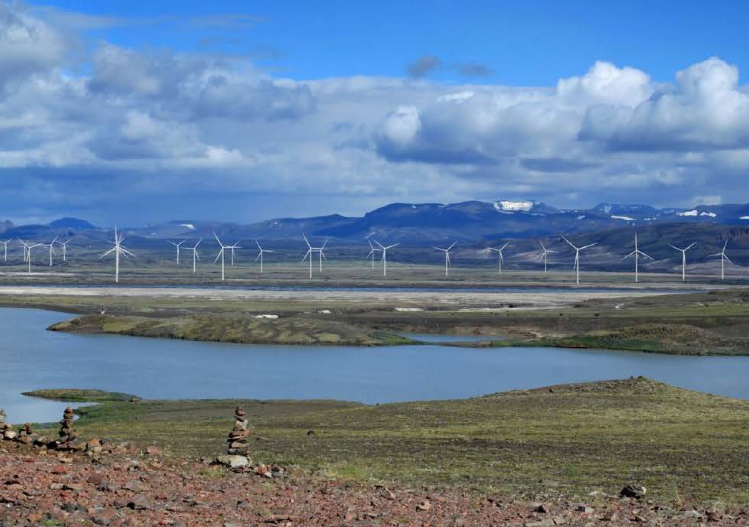 Hreyfiafl aims to have its first wind farm in Iceland in operation within five years from now. Icelanders can follow the process through the Twitter-account of Hreyfiafl. In mid February 2017 EU’s Innovation and Networks Executive Agency (INEA) published a list of energy infrastructure projects that have been selected to receive financial support from the European Union. 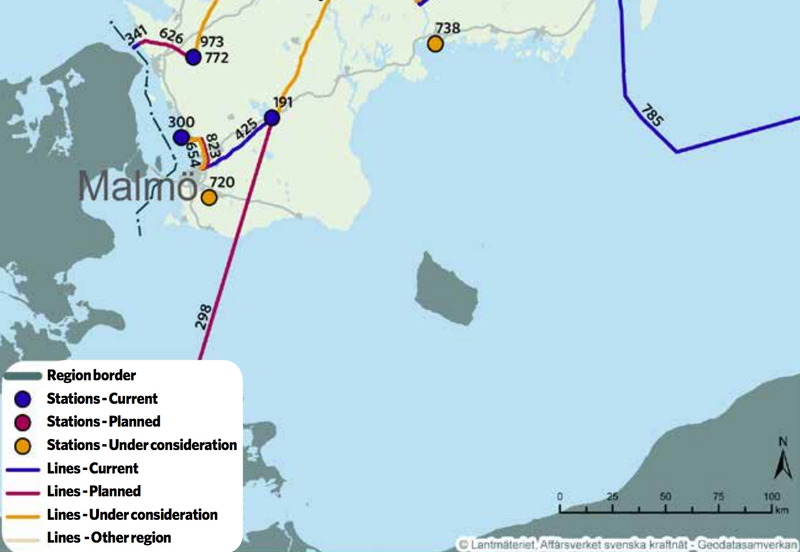 One of these projects, designated as a Project of Common Interest, is the NorthConnect HVDC subsea cable, to connect the electricity markets in Norway and Scotland. This decision by INEA makes the approximately 655 km NorthConnect project eligible to apply for funding from the Connecting Europe Facility, the EU’s funding support programme for infrastructure, receiving over EUR 10 million to support its development. The NorthConnect cable will have a capacity of 1,400 MW. As other subsea interconnectors with Norway, the NorthConnect is expected to further balance the grid between the relevant countries and allowing wider electricity trading across Europe. Thus, this new cable will not call for increased hydro power capacity in Norway, which generates close to 100% of all electricity by utilizing hydro power. 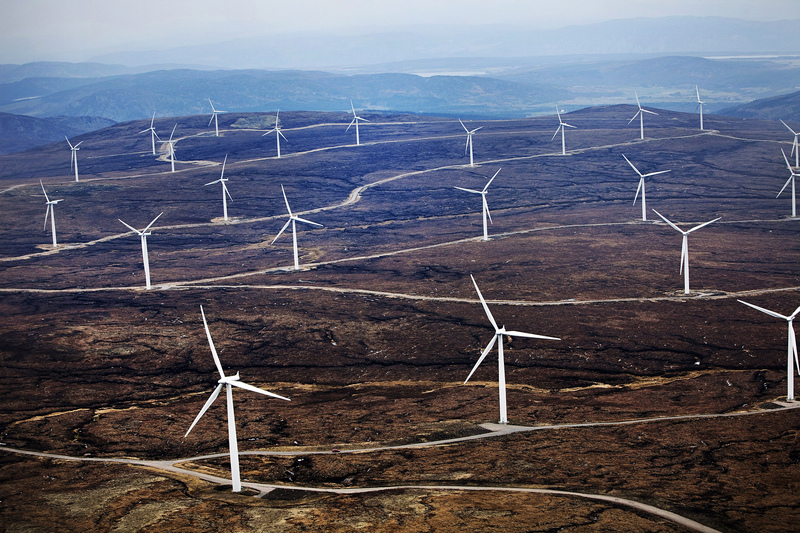 Scotland has been developing major wind capacity. 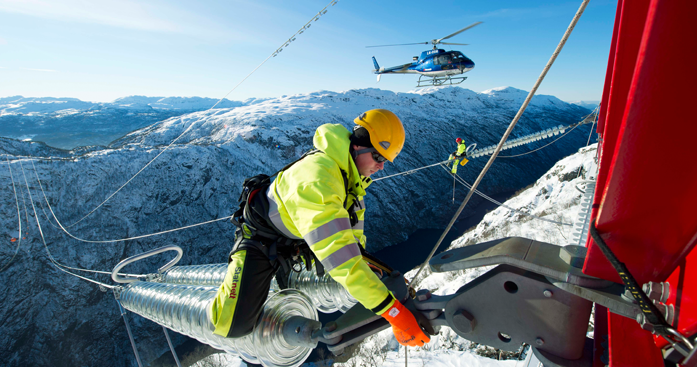 When strong winds will generate high amounts of electricity; the NorthConnect interconnector makes it possible to export part of the generation to Norway. Meanwhile, the massive hydro reservoirs in Norway will become like gigantic green batteries being charged. When the winds in Scotland will be calmer, the Norwegian hydro power companies will turn on their turbines, making it possible to export electricity to Scotland. This should increase security of supply and stabilize electricity prices for consumers. In addition, the new interconnector will increase the use of renewable energy in Europe. The NorthConnect power cable will be routed from Simadalen in Norway, across the North Sea to Long Haven Bay, just south of Peterhead in Scotland. On the Norwegian side of the link, the cable will follow the long Hardangerfjord in western Norway, until landing at Simadalen. The exact route across the North Sea has yet to be determined. The project is due to start construction in 2019, reaching completion in 2022. If everything goes as planned, NorthConnect will be the first subsea interconnector from Norway owned by power companies. So far all the subsea power cables from Norway have been owned by the relevant transmission system operators. Current owners of the NorthConnect project are the Swedish national energy firm Vattenfall and three Norwegian power companies; Agder Energi, E-CO and Lyse Produksjon. All these four companies are in public ownership; the Swedish state owns Vattenfall and the three Norwegian firms are owned by several Norwegian municipalities and the national power company Statkraft. A new 700 MW HVDC (high voltage direct current) subsea electric cable is planned to be constructed between Sweden and Germany. The cable is refereed to as the Hansa PowerBridge. The project has been on preparation level for several years, and now it has been decided that the 300 km long interconnector will be commissioned by 2025/26. In last January (2017) the Swedish and German transmission system operators (TSO’s) Svenska kraftnät and 50Hertz agreed on further details regarding the planning and construction of the Hansa PowerBridge, when a cooperation agreement was signed in Berlin. The new agreement includes time-schedule and provisions on the technical design, project organisation, ownership structures, cost allocation, tendering, construction and commissioning of the planned interconnector. The approximately 300 km long Hansa PowerBridge will be submarine at 200 km. The German grid connection point for the cable is planned in Güstrow, Mecklenburg-Western Pomerania. On Swedens side the cable will connect to the Swedish transmission network at Hurva in Skåne. 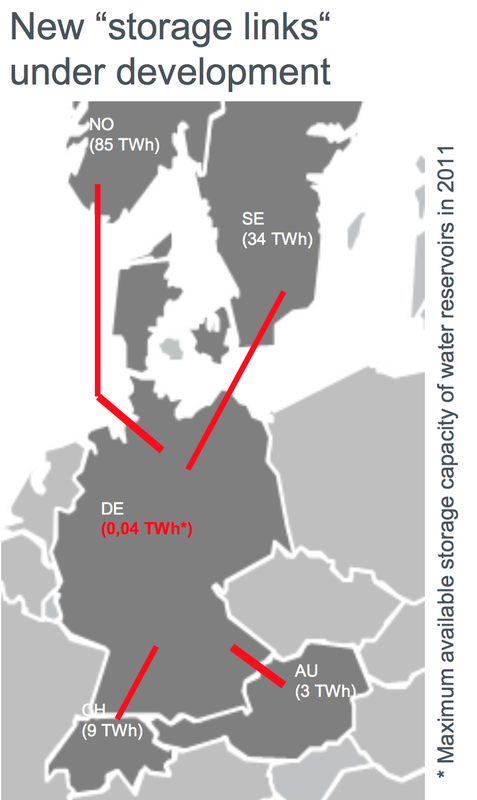 It is expected that German consumers will benefit greatly from being connected to Scandinavian hydropower capacities. Also the cable makes it possible for Sweden to import electricity generated by strong winds in the north-eastern part of Germany . The Hansa PowerBridge is seen as one more important step towards a common European electricity market, as it will improve the integration of renewable energy sources in the transmission system. As such it enables an even more efficient use of the renewable generation capacities across the border. This should contribute to the climate-friendly and cost-efficient generation of electricity. The next steps in the project will be preparations for the permitting procedure (to be concluded by end of 2021), then having call for tenders for the installations (in 2022), and finally the interconnector being operational in 2025/2026. The total investment costs is estimated close to 600 million EUR, and will be evenly distributed among the two TSOs. The competitiveness of new wind power has been increasing rapidly. 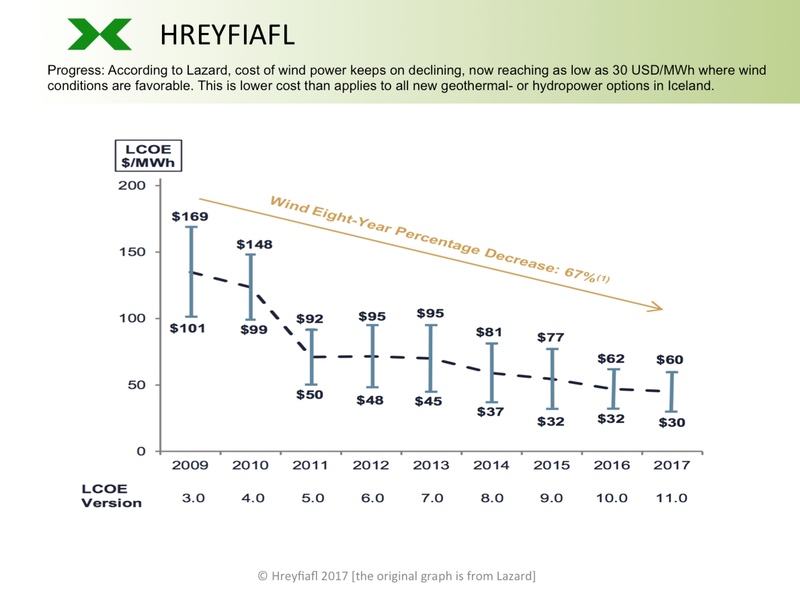 According to Lazard, the levelized cost of energy (LCOE) from onshore wind power in USA, is approximately 50% lower now than it was four years ago, and the lowest cost onshore wind projects now have a LCOE that is 33% lower than it was four years ago. As can be seen on the graph at left. The lowest cost wind projects in the USA now have a LCOE of 32 USD/MWh. The lowest cost projects are mainly wind farms in the US Mid-West, where wind conditions are good, resulting in a high average capacity factor. 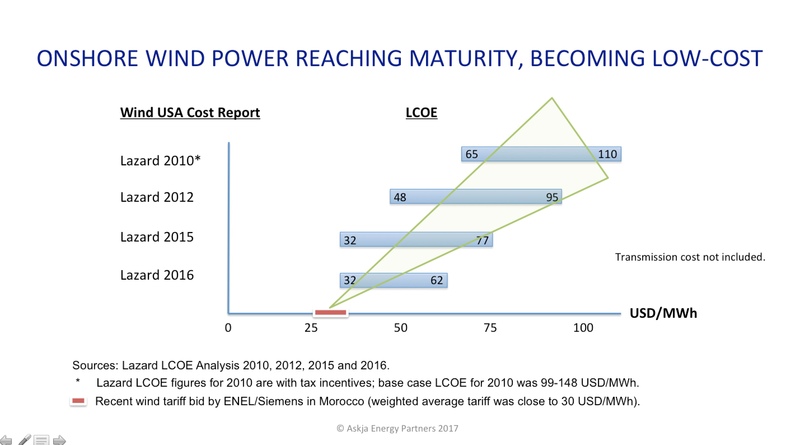 And even though the lowest cost was steady (did not decline) between 2015 and 2016, new very large wind farms can be expected to offer even lower cost than 32 USD/MWh. 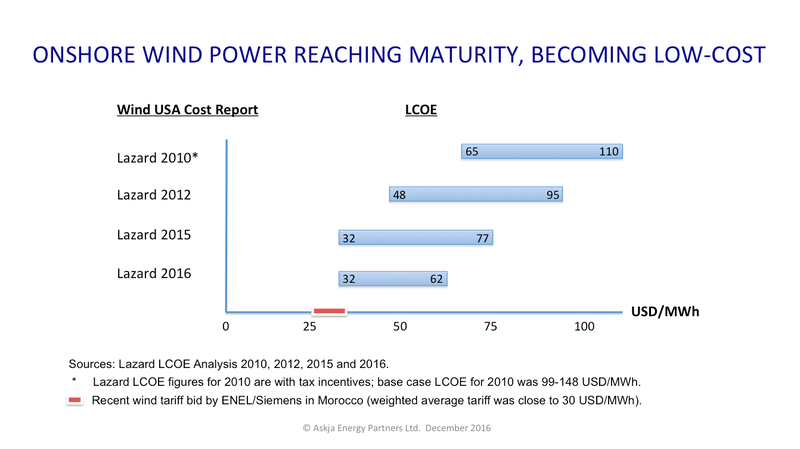 For example, Morocco did receive average bids from Enel and Siemens of 30 USD/MWh from its tender for totally 850 MW wind energy projects (with the lowest offer at around 25 USD/MWh). 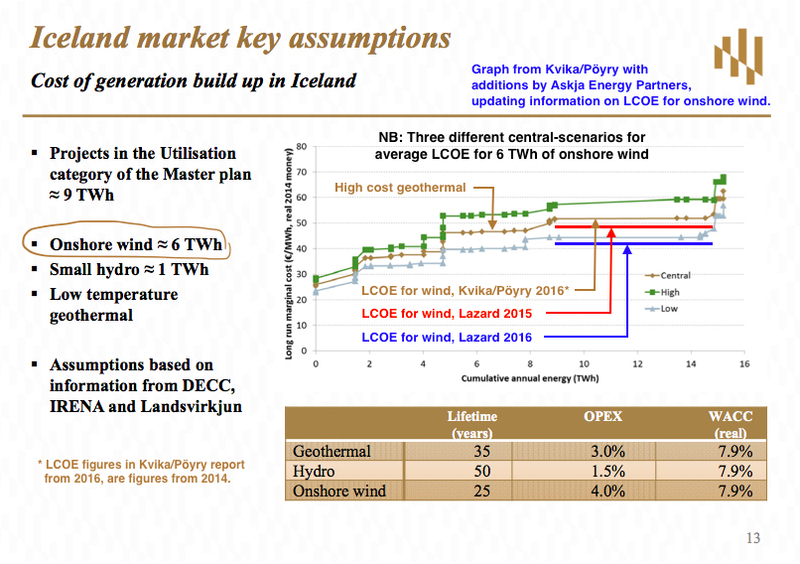 For the Icelandic energy sector, it is interesting to compare the figures in the reports from Lazard on LCOE, with a recent report by Kvika bank and Pöyry. 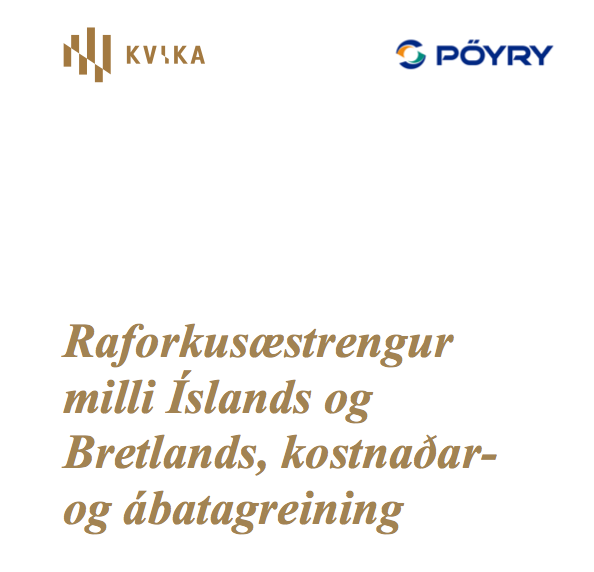 In the report by Kvika/Pöyry the LCOE for up to 6 TWh of new onshore wind power in Iceland is set at a fixed price (LCOE) of approximately 51-52 EUR/MWh. This is quite close to the average LCOE for onshore wind in USA as assumed by Lazard in 2015 (shown with red line on the graph at left). When having regard to Lazard’s most recent report, from December 2016, it becomes obvious that the LCOE for onshore wind has declined further (the blue line on the graph shows Lazard’s average for onshore wind in its report from 2016). 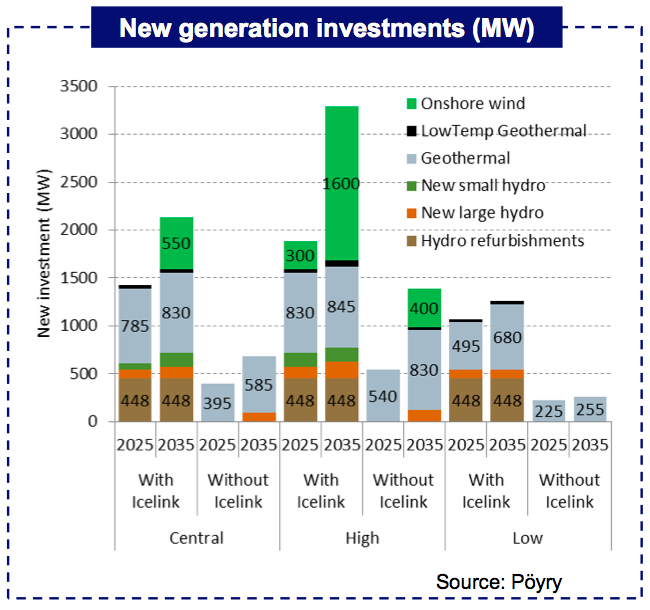 What then becomes especially important, is that now new onshore wind projects in Iceland can be expected to be even more economical than new geothermal projects. For more information on this issue, we refer to our earlier post on the subject. So far no wind farm has been constructed in Iceland. However, due to good wind conditions in the country and declining cost in wind power technology and generation, it is probably only a matter of time until we will see the first wind farm operating in Iceland. Unfortunately, many of the best locations for wind farms in Iceland may be excluded from development, due to protection of the wilderness of the Icelandic highlands. 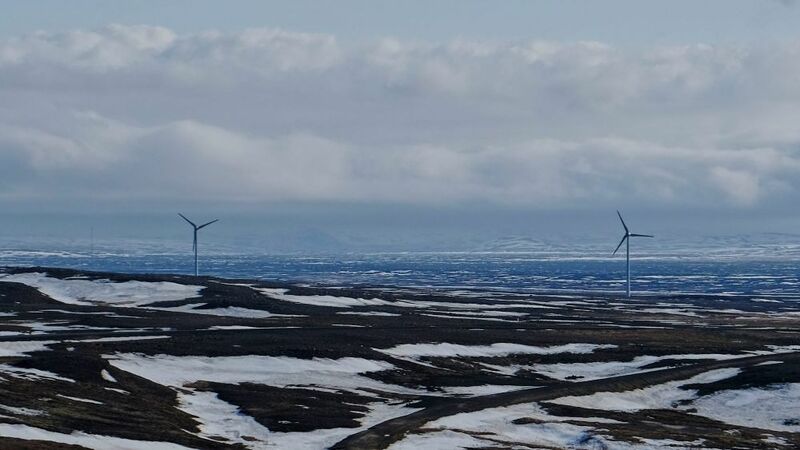 The Icelandic National Planning Agency (NPA) recently gave its opinion on the environmental impact assessment (EIA) of the proposed 200 MW Búrfell Wind Farm (Búrfellslundur). This is an ambitious wind project, which the Icelandic National Power Company (Landsvirkjun) has been preparing for years, in the highlands of Southern Iceland. The NPA concluded that the Búrfellslundur Wind Farm would have significant impact on the landscape and wilderness in the area, as well as on tourism and recreation. Furthermore, the NPA recommends that the power company should find another more suitable location, or scaling down the project. Both solutions would require a new environmental impact assessment. This opinion of the NPA means that Landsvirkjun’s first real wind farm project will be delayed. The company has already constructed two wind mills in the Búrfell area by Þjórsá river (photo at left), as part of a research and development project on the feasibility of wind power in Iceland. According to a statement from Landsvirkjun’s manager of wind projects, in 2015, the plan was to have the 200 MW Búrfell Wind Farm in operation as early as autumn 2017. Now, this plan has to be revised. The Búrfell Wind Farm, as proposed by Landsvirkjun, would consist of up to 67 turbines, each with a maximum height of 150 m (to the tip of the blade). Each turbine was expected to have a capacity of 3-3.5 MW. Total capacity would have been close to 200 MW, generating approx. 705 GWh annually. The main reason why the NPA gave a negative opinion regarding the project, is the location of the proposed wind farm. In March 2016, the Icelandic Parliament (Allþingi) adopted a special National Planning Strategy (Landsskipulagsstefna 2015-2026), emphasizing the environmental importance of the vast wilderness areas normally referred to as the central highlands of Iceland. According to the NPA, a 200 MW wind farm in the Búrfell-area does not align with the National Planning Strategy, thus recommending the power company to find another location for its wind farm, or scaling the project down. The area that was proposed for the wind farm by Landsvirkjun, spans up to 40 km2 of lava and sand plain. It is noteworthy that in the vicinity of this area, there are already two wind turbines (as mentioned above), in addition to several nearby large hydropower stations, with the relevant dams, reservoirs, transmission lines etc. However, the NPA is of the opinion that dozens of large wind turbines in the area will have such a strong visual effects it does not align with the recent National Planning Strategy. Having to find another location for its first wind farm will be a disappointment for Landsvirkjun, as the area at Búrfell offers very high capacity factor for harnessing wind energy. According to information from Landsvirkjun, the Búrfell Wind Farm could be expected to deliver an average capacity factor of close to 50%, which is substantially higher than most wind farms in the world enjoy. The negative opinion of the NPA towards the project is obviously not what Landsvirkjun was expecting. The power company has for several years put enormous work and effort in preparing the Búrfell Wind Farm, including foreign consulting to ensure high quality development of the environmental impact assessment. However, it was always clear that placing large wind turbines within the wilderness areas close to the volcanic Mt. Hekla, and adjacent to popular tourist routes, would be controversial. The decision of the NPA regarding the Búrfell Wind Farm will delay wind power development by Landsvirkjun. On the positive side, Landsvirkjun and other power companies now have the possibility to take note of an opinion by the NPA on wind power projects, in finding locations that are suitable for such major constructions. As there are numerous locations in Iceland that offer very high capacity factor for wind turbines, there is good reason to be optimistic on prosperous development of wind energy in Iceland in the coming years and decades.